The West Island Women’s Shelter is a non-profit organization registered under part III of the the Companies Act (RSQ, c. C-38) on 6 February 1979. Up until the 70’s, the vast majority of women in Quebec silently endured the violence and abuse inflicted upon them by their spouse. The combined influence of religion, family, gender stereotypes and differentiated socialization kept the women trapped in their situation. The psychological, physical and moral pain caused irreparable harm. In the mid- 70’s, citizens and women s groups decided to end the silence and publicly denounced conjugal violence as a social problem and decreed it should no longer be a private matter. As a result, at the end this decade, citizens of the West Island came together to help women victims of violence. With this in mind, a garage apartment was rented with the intention to save lives. This is how our shelter started! On February 6, 1979, the Shelter was incorporated. 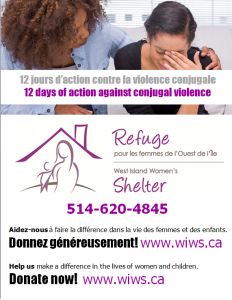 It was called:”West Island Aid for Battered Women, Inc.” Finally, there was a safe place for both women and children victims of conjugal violence. 1)..Establish a permanent home to temporarily help/house battered women and their children on the West Island. and to facilitate references and public education. In 1982, based on the analysis of the needs and resources within the community, a foundation was created and “our home” was purchased. In September 27th, 1989, the Shelter changed it’s name to: “The West Island Women’s Shelter”. At the same time, the Shelter’s mandates and objectives were redefined. Eliminate conjugal violence against women is now our mission. The concept of conjugal violence was clearly redefined. We no longer spoke of battered women and physical violence, but of conjugal violence in all of its forms. As time went along, through research and literature, the effects of conjugal violence on children were identified. As a result, in 1999, the Shelter implemented an innovative program called “The Discovery Group” whose goal was to educate youth how to express and identify their feelings towards conjugal violence as well as to support the mothers with their parenting skills. In 2001, the services for children exposed to conjugal violence was consolidated and summer camps were offered. On the eve of the 25th anniversary, we had many discussions about how we were going to recognize this major milestone, while, at the same time deploring the fact that there was still very much a need for a service such as ours in 2004. We felt there was a need to acknowledge the vision, hard work and dedication of the original founders who created the Shelter, as well as the staff and volunteers of today who continue to carry the banner of advocacy of a world without violence, where no woman or child has to live in fear of their life and well-being. In April, we held our very first Gala to recognize this important anniversary. We were proud to welcome many members of the community, our generous supporters and some of the founding members of the Shelter. The event, dignified and elegant, energized by the passion of the guests and volunteers who contributed to our cause. We were thrilled with the evening’s success and of the unveiling of our new logo. In 2006, we constructed “Alternat’Elle”, our second stage house to meet the post separation security needs of our women who are now the heads of single parent households. Today a multidisciplinary team provides various services to women and children victims of conjugal violence. In addition to providing temporary shelter, we have developed over the years various support services, such as a 24/7 crisis line, ongoing support, accompaniment and follow up services, which have also benefited many women and children who are not sheltered. We also offer information and awareness regarding domestic violence within the community.